Welcome back to the Power BI blog. This time, we’re going to be talking about the other part of the Key Influencers visual: the Top Segments. Welcome to our Power Query blog. This week I look at some of the M functionality for dealing with files. Welcome back to our Power Pivot blog. Today, we discuss the SUMX function. Welcome back to our regular A to Z of Excel Functions blog. Today we look at the EXPON.DIST function. 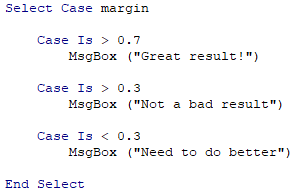 This month, we’re talking about the Select Case statement in VBA. We had a question from a client that we thought we’d take the opportunity to answer here. This week in Power BI, we’re going to look at a brand new feature that’s just been released, called “Key Influencers”. Welcome to our Power Query blog. Last week’s blog looked at solving a particular problem by using DateTime.AddZone(). This week, I look at some of the M functionality for dealing with time zones. Welcome back to our Power Pivot blog. Today, we discuss the SUM function. Welcome back to our regular A to Z of Excel Functions blog. Today we look at the EXP function.